Glycerine, also called glycerol or glycerin, is an odorless chemical used as an additive in many pharmaceutical products and cosmetics. Glycerine is used in body care products as a lubricant to increase the ease of product application and as a humectant to draw moisture into the skin. Although all glycerine performs a similar function in cosmetics and products, it can be derived from numerous sources. 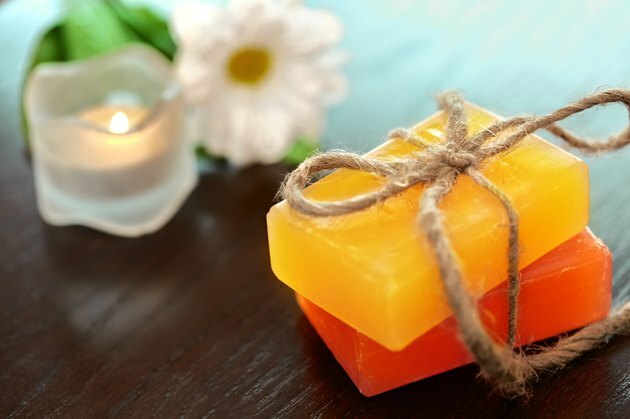 One source of glycerine is a byproduct of animal fat soaps. Glycerol from animal fats comes from animal triglycerides, one type of fat molecule commonly found in animal blood and the major component of an animal's fatty tissue, according to the Children's Hospital of Pittsburgh. Each triglyceride molecule contains three fatty acid chains, all connected to the glycerol backbone. During soapmaking, the bonds holding the fatty acids onto the glycerol are broken, giving off glycerine as a byproduct. Glycerine obtained from animal products is often labeled "glycerine." If you are concerned about consuming animal biproducts, you may also find products containing vegetable glycerine. Plants lipids are also typically stored as triglycerides. Plant triglycerides often differ from animal triglycerides because of their fatty acid chains; plant triglycerides commonly contain unsaturated fatty acid chains that form a bent shape, which allows the lipid to form a liquid oil at room temperature. Plant glycerine is obtained as a byproduct of soapmaking using plant oils. Many products that use vegetable oils as a source of glycerine may indicate that they are free of animal products or list "vegetable glycerine" as an ingredient. In some cases, glycerine may come from a synthetic source, generated in the laboratory as a product of chemical reactions beginning with petroleum. However, the market for synthetic glycerine has diminished over time, since glycerine from natural sources is readily available as a byproduct of several industrial processes, including soapmaking and biodiesel production, reports "Biodiesel Magazine." As the demand for synthetic petroleum dwindles, the magazine reports, it is likely that natural glycerine will be used in more industries.